Even the pros crash. When it’s your turn to spill the Enduro Engineering Radiator Braces will keep your bike in one piece. 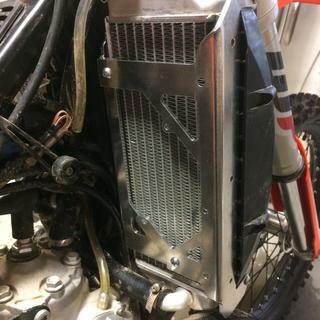 Enduro Engineering has made their radiator guards from strong, lightweight aluminum alloy that keeps weight down and strength up. The rad guards are one piece construction that mount directly to the frame to form a cage around the radiators to protect from front and side impacts. Installation is simple with the included hardware, and once finished the guards will fit snugly underneath your plastics to maintain the original factory look. They fit good and are definately tuff! installation is a little tricky and instructions werent great. they look good, overall i am pleased and the price was right! I'd been waiting to get these on before trying gnarlier trails where the chance of crushing a radiator is high. So far they haven't been put to the test, but riding is so much less stressful knowing my rads are protected. These were the first radiator braces and guards I have ever ran and seemed to install fairly easy. They have a lot of parts but that is to be expected. Read entire instructions first then start installing so you don't have to go back like I did. Fit is great, looks good, and function is awesome. I've seen bikes use these and keep riding. Great insurance for a potential costly repair. Super easy to install, especially if you follow the directions. Feel very sturdy and will hopefully help from any impact that may happen or drops. I ended up sending these back. I found them to be too bulky and I wasn't impressed with how they were to be installed. Installed pretty easy. Seem bulry and ready to withstand a hit. Great product, easy to install and perfect fit. Have used these braces and guards on several bikes for woods racing. do what they should. protect your radiators in the event of a fall from side impact. worth the money! 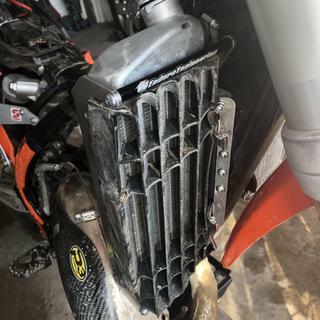 2016 KTM 350 XCF Radiator braces. Naught these braces for my 2016 KTM 350 XCF. They fit great unlike other brands I tried and has to return. I tipped my hike over and hit my radiator on solid rock and they saved my radiator. I also wiped out pretty hard and flipped my bike and there wasn’t any damage to the radiator. They seemed to have madepritrxtrd just fine. Fit is good. All hardware comes in kit. Don't follow the directions, and waste your antifreeze by emptying the radiator! Just loosen the gas tank, be careful to not move the radiators too much, and you're good to go! I have used these radiator braces on other bikes in the past. they greatly increase the rigidity of the radiator to prevent damage from the side impacts. the stock radiator louvers are able to be used and there is no airflow restriction. installation requires some care to provide clearance for wires and hoses. the weak point of these radiator braces is where the back sections are attached to the side plates with short 6mm screws. a severe hit will cause the threads to pull out of the aluminum plate. now when I install these, I also use an adhesive on the side plate overlap before installing the screws which seems to prevent the two parts from separating. also the radiator mounting bolts included were the same length as the stock bolts which are 5mm too short. not a problem just inconvenient. Had to call Enduro Engineering several times on fitment. Once installed they do put a lot of stress on the radiator plastics, even bending the should at the top corner. These provide excellent support - and I'm one to test them ;-). I usually tip over at least once a day. It was a pain to install - having to remove antifreeze from the radiators. I've used EE radiator braces on several KTM's in the past. While the brace should provide good protection, I'm not too impressed with shroud fitment. EE uses rubber bungies to attach shroud. Not sure how other options might address this. Hopefully setup will prove to be reliable. P.S. - installation instruction calls for draining some coolant ( picture was in error for 250. Install can be accomplished by just disconnecting top radiator hose(s) ... minimal coolant loss. bungee has one attachment on shroud the other end connects to hook on EE brace. These braces are good quality and they do protect your radiators however the fit of the plastic over the braces wasn’t very well thought out to combat this the mfg gives you a really cheesy way of hook up your plastic to the radiators in front. You can modify your plastic and the braces a bit and reattach the shrouds with the stock bolts however I’m not keen on modifying the stock bike to make an aftermarket part work when there are other options available that function just as well with no mods. I said I would not recommend this just because of the fitment, but they do protect the rads like there suppose to. Lots of protection. I wish the fit was a little slimmer so you could use the factory fasteners instead of the rubber bands. Other than that they are great. Best rad guards I’ve used. Awesome braces. Have them on two betas. Fit, finish, and function are excellent. Great protection and install wasn't too bad. I'm not too fond of having to use the rubber band things to hold the radiator shrouds, but whatever...at least the shrouds will "give" a little when dropped or pulled by a branch/tree, etc. 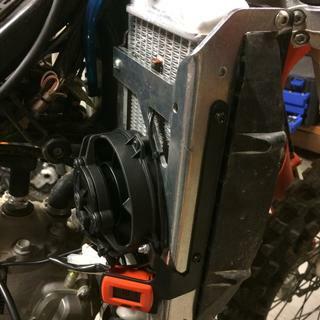 Trail tech radiator fan mounted easily to the Enduro Engineering bracket (holes lined up perfectly). Do not try to mount fan using the Trail Tech bracket though. Great price but definitely a project to install. Fits good and i like the rubber straps that replace the shroud bolts but definitely is a project to install seeing that you have to drain radiators. But can’t beat the price. Purchased these to replace 2 year old Unabiker cage/braces on the WR250F. 1st hare scramble race was this weekend and the bike went down on the right side, the impact combined with forward momentum pushed the cage back towards the fuel tank, tweaking the soft aluminum and breaking the plastic radiator shroud. These cages do not have a brace that anchors them aside from the two bolts that screw into the OEM frame mounts. Poor design for the style of riding I do. Now I'm going back to the Unabiker option due to a MUCH LESS EXPENSIVE $99 option, which comes with front cages, and braces to support them. Way better bang for the buck, and way better at protecting my bike. It looks to me like the Moose Racing style are the exact same as the EE, so I would NOT purchase either of them again. Used these prior on my Honda 450X. Purchased a new 2018 Beta 300RR and these fit perfect. No mods needed just install. 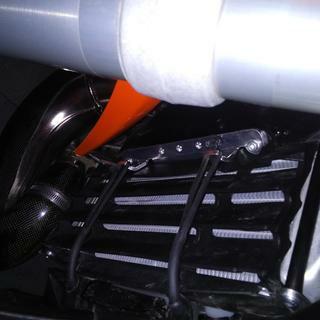 Fit to my KTM 450SXF very good and are beefy and will protect the rads. Highly recommended. Instructions were very poor. Fitment was horrible, radiator shrouds would not fit correctly with braces on very disappointed in these. Iam not using these on my bike. Brand new bike, start of the art. The brace was a disappointment. The structure over all is fine, but I am not happy with the rubber band shrowd attachment. I want it to bolt on and fit exactly like before. The new KTM shrowd design is very tight clearance, very clean look. This brace undoes the super clean tight look with sloppy rubber band fitments. Does not fit 2018 Husky TE (or FE) without modification. Does not fit 2018 Husky TE150 (or any other model of TE/FE bike) without modification. Outer brace piece was far too tall at the top where the plastics need to go over top. I had to grind/file away A LOT of metal before plastics would clear the brace. Front fender also rubs the brace a bit at the bottom. While I like the brace, and think it is quite well made, it is not a good fit for Husqvarna bikes due to clearance issues. Meanwhile, my buddy's 2018 KTM XC 250 did not have the same problems when installing. I tried to put these on a 18 husky fe 501. The fit is very poor. The instructions are poor. I was supposed to complete step 14 right after step 7 and that led to a whole bunch of problems. Then, just as I was finally getting them on, the last bolt stripped just as it started to tighten. These guards use rubber bands to hold the deflectors on the front of the radiator. They are now in the trash because I had to modify them to try to get them to fit. 3rd bike I have put these on and they have worked great on them all. Another great product from EE. Installation was a piece of cake. It was a little challenging figuring out what screws went where but I was quickly able to sort it out. When you watch the EE instalation video on their website it says you dont really have to drain any coolant...well, I made a mess, should have just drained a little. I have 0 hours drive time on them since its mid winter here in Michigan but they do seem much stronger than just the radiators by themselves. They fit well, directions walked me through the whole process very well and helped me save my coolant. These have saved my radiators many times in some gnarly single track. These are a very solid piece of gear. In fact too solid for me. For a 2018 KTM 500 exc the braces weighed 2.51 pounds. These braces are really solid but I did not want to bolt on more than a kilogram of weight to the upper part of my bike. Returned them today. The fit was poor. The instructions were difficult to work with . I used to think EE had the best gear, but this product ( radiator braces) was not well planned. I have had these guards on my last 4 bikes and they work great. Offer good protection for side impacts but still allow good air flow. Alot cheaper than some of they alternatives. liked the fact that they were well thought out. spacers provided for the shrouds and rad mounts kept things fitting properly. Solid brace for side impacts with very little obstruction of the air flow. Can't see to be bending my radiator any time soon. Fitment around the radiator is great. The instructions are confusing. I believe a set of pictures in the instructions was upside down - well manageable after you figure that you put it on backwards. What I really dislike about those braces it that the shrouds hardly fit in the original screw holes. EE wants you to use some rubber straps to pull the radiator shrouds close to the bike. I managed to squeeze the tabs over the original holes and use the regular screws but its overly tight squishing some ribs behind the shrouds. Another thing is they claim on their web site that a OEM fan would fit - they are talking about the old version without the digital thermo switch. It takes some work to get a new fan module mounted and requires the original fan bracket to be cut up. I also modified the plastic mount of the fan to get it as close as possible to the radiator, trying to avoid it sucking air from the sides. I would give it 5 stars if the shrouds would fit around it besides that mounting a fan is a little challenge. Everything lined up without modification and installation was a breeze. I have used EE products for many years and they are always high quality. Highly recommend. Super Durable and Excellent Fit! Had to remove my horn but these braces / guards are great. Look sharp and are extremely durable. Fit perfect on my Beta. Easy to install, plastics fit back like stock. I cracked 2 braces in the exact same spot. They replaced them under warranty. They seem to offer good protection, granted I haven't had any real bad crashes with them. But, a bummer none the less. Little tricky to get on but with the price! I trust these braces to protect my radiators during a bad crash. The instructions were a little confusing, and it was a tight fit for the wires running against my frame, but I made it work. I have 2017 ktm 300xc and just ordered enduro engineering radiator braces. Will this fan and the radiator braces work together? BEST ANSWER: If I had to do it over again i would not of purchased the EE rad. braces. I had to do a lot of modding of the braces to be able to bolt it back together. Also had to trimn the inside webbing of the rad. shrouds. Then I was only able to bolt everything back together while everthing was loose. I didn't like the way it looked when using the rubber connecting straps that they send for attaching the shrouds(since they know things will not bolt back together). The Trail tech fan will bolt on to the right side brace. Not very well, used some on my 2010 300 XC-W and had fitment issues with installing the rad shrouds back on.. Having same issue now with '17 YZ250X, I don't think EE really takes time to make sure these mount up and allow you to reinstall your shrouds with OE fitment. Not 100% sure about fan but when I installed these braces on my son 2017 ktm 125sx the fitment was tight and secure. and I'm sure that you could attach the fan to them. They did on the Beta.I would imagine KTM would be the same. Will these fit my 2018 wr450f with stock radiator fan? BEST ANSWER: Yes they will work with the stock fan. Are these bolt on without having to drain the radiator and hoses ? BEST ANSWER: Have fitted these to 4 KTM's and all bolt on without draining or removing hoses. Just need to remove shrouds and unbolt radiator from frame. Easy job, take your time should be 1/2 hour! You will need to drain the radiators to install these unfortunately. 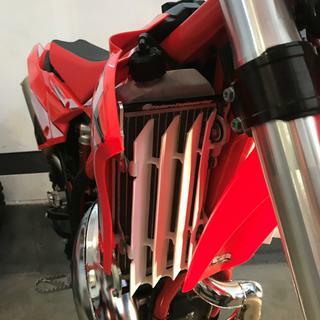 You also can not install the bolts that connect the shrouds to the radiator fins/louvers, you will have to use the rubber straps the keep the shrouds from flaring out. They are the same rubber straps that are for your kickstand. Those are the 2 most annoying things about these guards, otherwise, they are very protective and do a great job. They are being study and protect your radiators well. You also don't notice the rubber straps, it isn't a big deal. 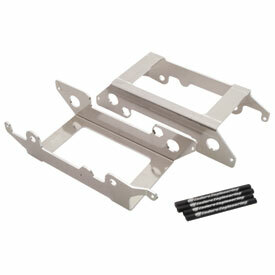 Hello Gary and thank you for the interest the Enduro Engineering Radiator Braces. Most models do not require draining the coolant. You can typically just disconnect one radiator at a time from the top cross over tube which will allow you to insert the frame side of the brace between the radiator and frame. Hope this is helpful. I didn't drain anything (2018 KTM 350 XC-F). Just disconnected the radiator from the cross over tube, slid in the brace, and bolted everything down. Wasn't too bad at all. No they’re not. You need to drain your fluid. However what a great chance to disassemble things, add clean new fluid and inspect everything. They’re a great product. You need to drain, and remove the radiators and is very tricky t to reasamble de plastic covers. You do not have to drain the rad. Can you still use the GYTR radiator fan? BEST ANSWER: Yes, I have them on and the fan too. No guesswork or grinding or having to use a file. In fact these braces are stronger than GYTR. yes you can, no problem at all ...at least on yz250fx . Yes, speaking for the fan that came on amy WR450. Yes they will work with the GYTR fan. Is price for 1 set? Or just only one? Will fit in a Sherco Sef-r 450 2016??? And with the stock fan? Thank you for the interest in Enduro Engineering products but unfortunately we do not offer braces for your application at this time. These look beautiful against the stock radiators. Will they wrap around the Tusk radiators that I bought? BEST ANSWER: We have not test fit these with the Tusk brand radiator. If the Tusk radiator is listed to be the same size as stock then it should work fine, but if its listed to be a larger capacity then it will not work. I have a 2016 YZ250fx with factory fan. Will the braces fit? Also will the shrouds attach to the braces? BEST ANSWER: Yes they will work with the factory fan. The shrouds will reattach to their original mounting location. I have a 2015 KTM 250 xcfw and installed the radiator braces and guards. The right radiator rear brace bracket is contacting the coolant hose badly. Is this a known issue? BEST ANSWER: Yes have seen this before. It varies for different applications and depends on how the bike was assembled. Typically this can be resolved by loosening the radiator hose clamps and rotating the radiator hose away from the brace and then tightening the hose clamps back down. Feel free to reach out to us if this does not fix the issue. I have a 2004 ktm 200 exc and I wanted to know the part number? BEST ANSWER: Once you enter in your machine in the drop down boxes above the product image you'll see our part number 1393000001. 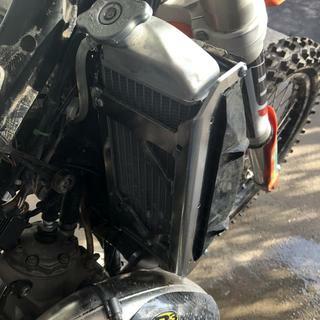 I have after market radiators for my 2003 yz250f I want to know what the measurements are for the braces? BEST ANSWER: If your radiators are labeled as over sized or larger than stock then these will not work. If they are labeled as a stock replacement then they will work. I have a 2018 300 xtrainer which has a factory fan. Will these guards bolt on without modifying the factory setup? BEST ANSWER: Yes, the factory fan will work with our brace. BEST ANSWER: We have a warehouse in Utah as well as Kentucky. it fits the 2017 fc 350 husqvarna?? it fits the 2017 ktm six days 250 xcw ?? BEST ANSWER: Yes, the radiators are the same on the six days edition as the standard 250 XC-W which we have a listing for.